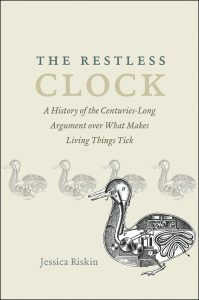 Over at Steve Reads, Steve Donoghue from Open Letters Monthly recently counted down his top ten reprints of the year. Number one? 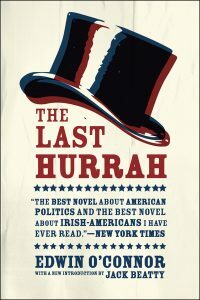 Edwin O’Connor’s The Last Hurrah: A Novel, a fictional take on the rise and fall of a mid-century Irish-American politician and the unstable democratic machine that lifted him up and plopped him back down, inspired by the life of notorious Boston mayor James Michael Curley. As Donoghue writes: “The absolutely winning production of this, the best reprint of 2016 includes a rollicking Introduction by Jack Beatty, an understated, smile-inducing new cover design, and of course the main event, O’Connor’s utterly masterful dark comedy of American politics, which is as funny and insightful today as it was the year it was written.” Still time to tuck this one under your menorah, tree, or secular mantelpiece. . . . in the meantime, we’re taking a week’s hiatus—see you on Tuesday, January 3rd, 2017. To read more about The Last Hurrah, click here. . . . 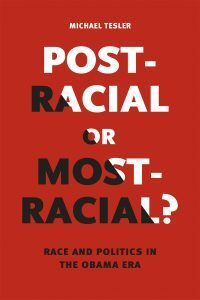 In a recent piece for the Huffington Post, Michael Tesler (author of Post-Racial or Most Racial? : Race and Politics in the Obama Era) analyzes public opinion data that corroborates an account of the 2016 election that looks beyond the white-working class neglect narrative and concentrates instead on the role played by racial prejudice. As he summarizes, “Racially resentful beliefs that African Americans are getting more than they deserve were so strongly linked to support for Trump, in fact, that their impact on both the 2016 Republican Primary and the general election were larger than they had ever been in before.” Read an excerpt from Tesler’s research below, which runs the numbers and frames the context in which they were generated. *** Such different portraits of white and non-white Americans’ grievances have their origins in what social psychologists call “ultimate attribution error.” This error means that when whites struggle, their troubles are generally attributed to situational forces (e.g., outsourcing); but when non-whites struggle, their plight is more often attributed to dispositional traits (i.e., poor work ethic). Consequently, whites are considered “more deserving” than blacks. To quantify this double standard in deservingness we embedded an experiment in a new HuffPost/YouGov survey. We asked half . 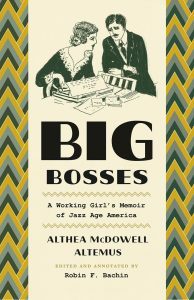 . .
From a recent review of Althea McDowell Altemus’s Big Bosses: A Working Girl’s Memoir of Jazz Age America, at the Chicago Tribune: This professional typewriter and her trusty typewriter give the reader tales that are of immense social, historical and feminist significance. Of the flagrantly discriminatory hiring practices faced by female job seekers, she writes, “Whatever crime it is for a woman … to wish to earn her own living and keep her child with her, I do not know — but crime it seems to be.” Yet so, too, are her tales dishy, witty and a ton of fun. Of one of the many decadent poolside parties Deering threw at Vizcaya, Altemus writes, “Only the tropic moon could ever know what the philanderers and their filomels found so satisfying in this pool and even romantic moonlight couldn’t penetrate the awning roofed cabanas in the pines.” Her situation — a bright, driven woman required by circumstance to support herself financially — was not atypical. But her famous employers were, including such men as Samuel Insull, president of Chicago Edison; New York banker S.W. Straus; real estate developer Fred F. French; a Swiss architect; and a jeweler whose primary clients were prostitutes. In doing . 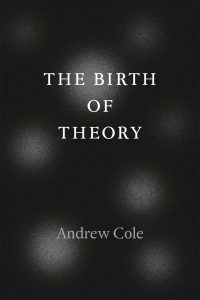 . .
Andrew Cole’s The Birth of Theory posits Hegel as the world’s ur-critical theorist, accounting for the origins of his dialectic as a theory, and situating the thinker’s unconventional (for modern philosophy) turn toward the medieval and premodern realms, which ultimately embedded Hegel in its long tradition, and suggested “that it is precisely Hegel’s engagement with medieval modes of thought that make his work a productive source for Marx and the later thinkers who develop dialectical thinking into theory as we know it today.” Cole’s work was previously reviewed by the likes of Qui Parle (“The Birth of Theory is filled with illuminating and often counterintuitive readings. . . . Cole’s argument touches on an array of important avenues of inquiry, offering counterproposals that should unsettle the doctrinally comfortable and reinvigorate theoretical discussions in a variety of connected fields: Hegel scholarship and the history of Continental philosophy; Marxist and post-Marxist analysis of culture, ideology, and commodity fetishism; literary criticism, whether historicist or not; and contemporary discussions of new vitalisms, materialisms, and speculative ontologies. . . . The Birth of Theory offers a set of tantalizing and highly original arguments.”) and the Review of Metaphysics (“The Birth of Theory is an ambitious, original, lucidly-written, scrupulously-researched, . . .
Neil Steinberg and Sara Bader, editors of Out of the Wreck I Rise: A Literary Companion to Recovery, recently sat down with the hosts of NPR’s Weekend Edition to discuss their pathbreaking anthology, which makes use of the longstanding and complicated relationship between creativity and addiction to offer a resource for the seventeen million plus adults living afflicted in the United States alone. *** From the transcript: SIMON (host): Let me ask you, Neil, what’s the thinking behind this anthology? STEINBERG: Recovery is difficult. And it’s hard enough just chemically giving up the substance you crave, but it’s also hard intellectually and emotionally. You’re giving up something you love, and you have to replace it with something. And I wanted to try to replace it with a story, with a narrative that recovery is the path of the hero. And Sara and I try to use that by using quotes from poems and songs and stories and letters from these writers throughout time who faced the same challenge and wrote about it. And the purpose of the book – we call it a companion so that it goes with you and helps you on this very difficult journey. SIMON: . 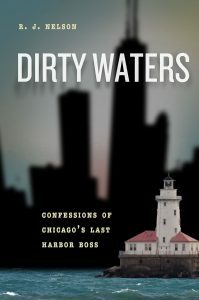 . .
From a recent Chicago Reader review of R. J. Nelson’s Dirty Waters: Confessions of Chicago’s Last Harbor Boss, the story of one city employee’s rise and fall as Chicago’s director of Harbors and Marine Services: Dirty Waters, a fine chronicle of Nelson’s tenure as a city employee, begins with his first day on the job and concludes not long after he was ignominiously terminated by Forrest Claypool, then the Park District’s general superintendent. What Nelson encounters during that time will be familiar to anyone with a rudimentary knowledge of local government: parks department supervisors who demand permits for their personal boats, inept public-sector employees who receive high salaries due to political connections, and obfuscatory paperwork designed to deaden the enthusiasm and limit the geographic and civic access of ordinary boaters. t a play-by-play account of Nelson’s time as harbor boss, Dirty Waters might get bogged down by inside-baseball accounts of bygone local politics. 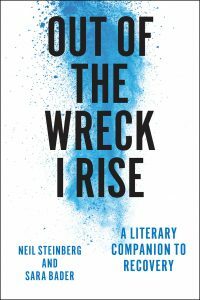 But there’s a certain Chicagoness to Nelson’s storytelling that’s highly entertaining—the book reads like a series of anecdotes being told by a lifelong resident of the city. Nelson can veer off on tangents, sometimes excessively so, but more often than not the asides keep the narrative interesting, provide valuable context, . 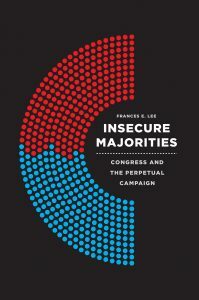 . .
A recent piece for the Upshot blog at the New York Times on the pro-rural bias of American electoral institutions made good use of political scientist Frances E. Lee’s research on the history of congressional partisan conflict, the subject of her latest book Insecure Majorities: Congress and the Perpetual Campaign. In considering the ideological residue from “Thomas Jefferson’s agrarian America” and its “yeoman farmer” ideal, the NYT posits how the ongoing influence of the rural vote triggers our very notion of the kind of person who should be able to hold office. which ultimately shapes just the conflict Lee specializes in: Rural America, even as it laments its economic weakness, retains vastly disproportionate electoral strength. Rural voters were able to nudge Donald J. Trump to power despite Hillary Clinton’s large margins in cities like New York. In a House of Representatives that structurally disadvantages Democrats because of their tight urban clustering, rural voters helped Republicans hold their cushion. In the Senate, the least populous states are now more overrepresented than ever before. And the growing unity of rural Americans as a voting bloc has converted the rural bias in national politics into a potent Republican advantage. “If you’re talking about a political system that skews rural, that’s not . 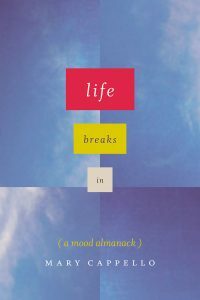 . .
Below follows an excerpt from a recent interview with Mary Cappello at Essay Daily about Life Breaks In, her exegesis (or, biography) (or, as the subtitle states, “almanack”) of mood, which captures the spirit of associative thinking and lyrical fluency that propels the book. *** Q: How much of mood is like trying to describe the uncanny—or—how important is the uncanny to writing nonfiction? A: I hope you don’t mind if I refer to an interview I carried out around my previous book, Swallow, in which I discuss the importance of the uncanny to my work and to nonfiction generally: http://www.propellermag.com/Fall2011/Cappellofall11.html I think the uncanny is at the heart of literary nonfiction. The places where the real slip-slides with something unrecognizable, where the familiar and the strange switch places. Cognitive dissonance. Home not home. The pleasure and necessity of altered states. At the risk of sounding psycho, I’d like to use the occasion of your question to try to put into words an “episode” I experienced in these days following the 2016 presidential election for the way it speaks to the alteration of the “real” as some of us know it. What Freud says about the uncanny is that, when we’re in its midst, there’s . . . 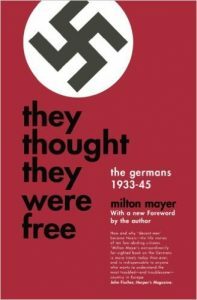 Following the 2016 presidential election, a group of Redditors digging for context and historical parallel rediscovered an excerpt on our website from Milton Mayer’s 1955 book, They Thought They Were Free: The Germans, 1933–1945. There, Mayer interviews ten German citizens, all Nazi Party members, following the war about the course of their lives during that decade, in order to determine what, precisely, had made them Nazis. As Mayer put it: What happened here was the gradual habituation of the people, little by little, to being governed by surprise; to receiving decisions deliberated in secret; to believing that the situation was so complicated that the government had to act on information which the people could not understand, or so dangerous that, even if the people could not understand it, it could not be released because of national security. And their sense of identification with Hitler, their trust in him, made it easier to widen this gap and reassured those who would otherwise have worried about it. Below is the excerpt in full. *** But Then It Was Too Late “What no one seemed to notice,” said a colleague of mine, a philologist, “was the ever widening gap, after 1933, between the government and . . .